Nordlys is a general-purpose semantic search toolkit, which can be deployed on a local machine. There is built-in support for certain data collections, including DBpedia and Freebase. You may download these data sets and run a set of scripts for preprocessing and indexing them, as explained below. Alternatively, you may use the data dumps we made available; since those are huge, they are not on git but are available at a separate location (see below). Data are a crucial component of Nordlys. Note that you may need only a certain subset of the data, depending on the required functionality. See this page for a detailed description. 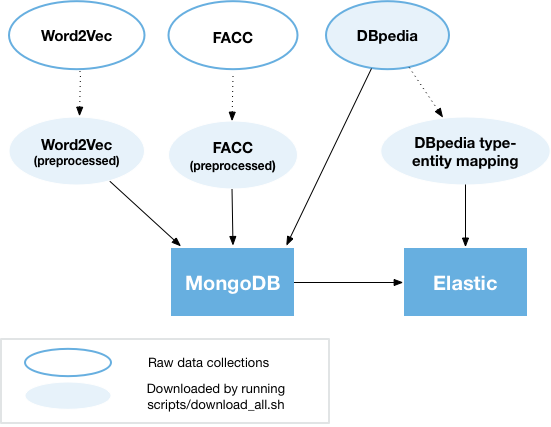 We use MongoDB and Elasticsearch for storing and indexing data. The figure below shows an overview of data sources and their dependencies. All scripts below are to be run from the nordlys main directory. To load the data to MongoDB, you need to run the following commands. Note that the first command is required for all Nordlys functionalities. Other commands are optional and you may run them if the mentioned functionality is needed. Run the following commands to build the indices for the mentioned functionalities.